I have been contemplating whether or not to share this little project on the blog and after having received great feedback from friends I decided why not! Mikey and I are constantly looking for new pieces of art to hang in our apartment and I am extremely picky. I saw a version of this painting and decided I would go for it, I had nothing to lose! Don’t be intimidated, it was soooo easy! And the best part about painting is that you can always cover it up and start over. The hardest part about this project was figuring out if we should hang it vertically or horizontally! 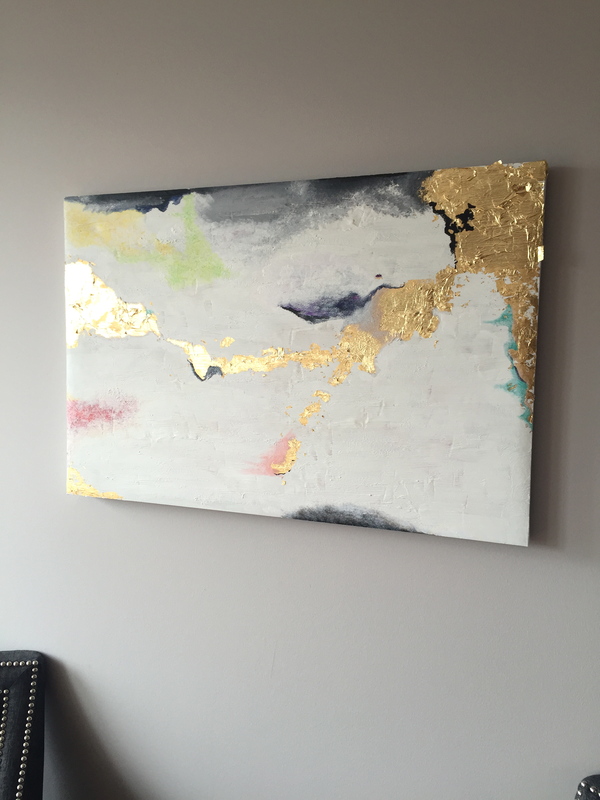 We love the end result and it was a fun, cheap way to add some pizazz to our home. 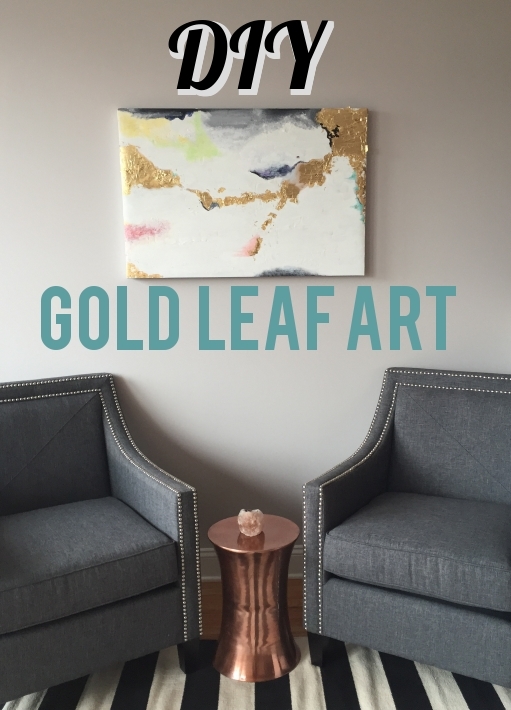 Below is a step by step description of how to make your own version with gold leaf at home. 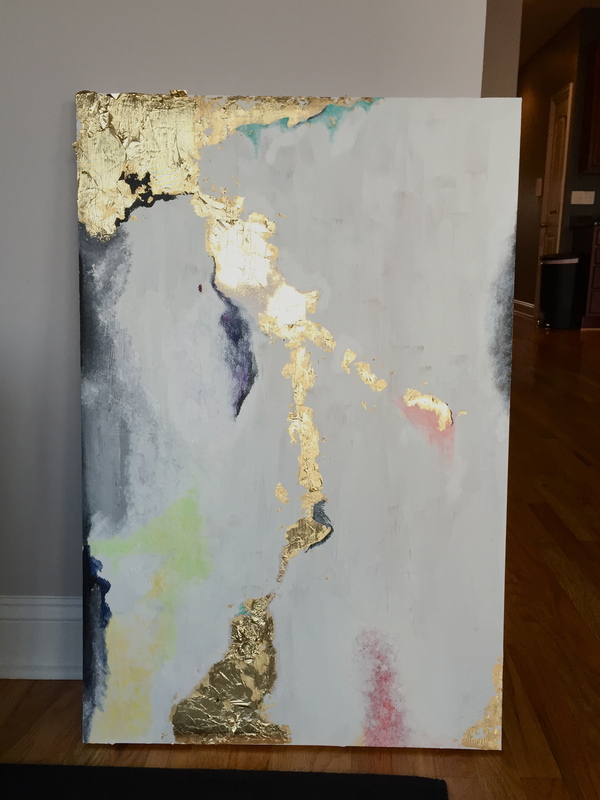 I started out with an old, ugly canvas we had lying around the house. It was bright orange with some trees and it was time to go. 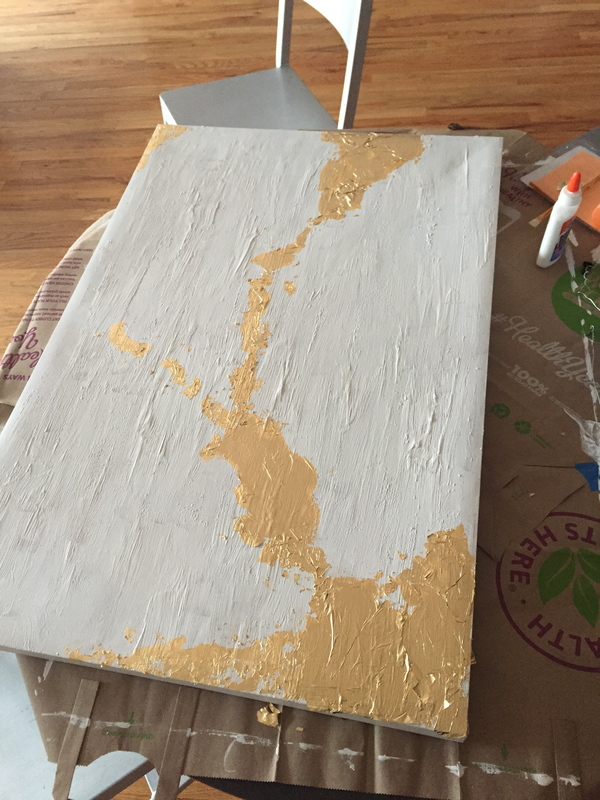 I first painted over the canvas with a medium surface prep gesso (I got all my supplies at JoAnn Fabrics). It is what adds the texture. It is like a thick paste. You can get different weights. Mine was medium. Heavy would work too. I painted it on sporadically and let it dry. I then painted over the entire canvas, sides included, with white house paint we had lying around. 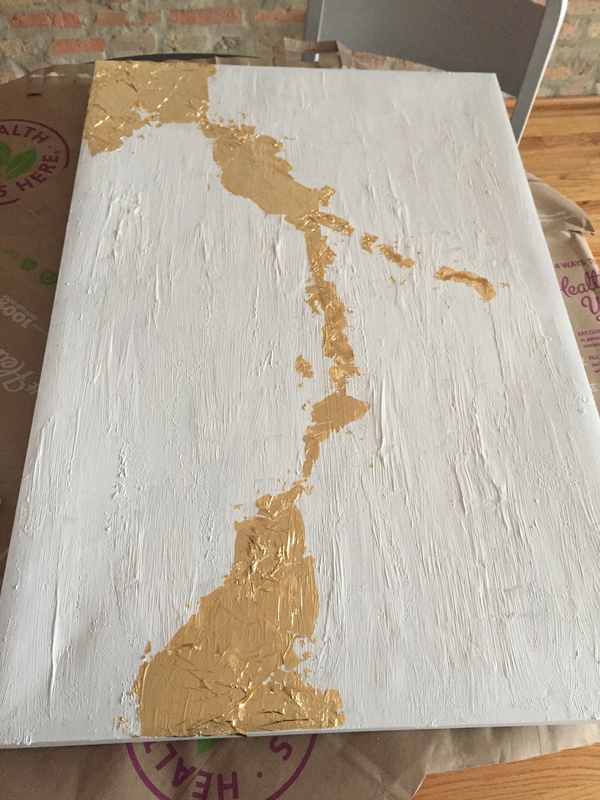 I let it dry for the most part and then began to apply my gold leaf. I just painted on Elmers glue where I wanted to add the leaf and then gently set the sheets down. I used a small brush to add and remove pieces and then brushed some glue around the edges where the leaf was lifting up. I then began to add paint. There was no method. I just grabbed a color and began to add it. This was the hardest part for me because I didn’t want to stop. I would paint a part, walk away, come back and add more. It was so fun to add different color bursts and if it became too much I just added more white or covered it. When I finally finished (forced myself to put the brush down and back away) I didn’t love the piece. Mikey was super supportive and said he loved it but it took me about a month until I decided I liked it enough to hang it up. It was a really fun and cheap project with surprisingly satisfying results! If you have any questions about how to get started or the process please don’t hesitate to ask! Thanks!! If you want something like it I 100% would love to make you one for the new house!!!! I agree with Kara – it’s beautiful! I might need to take you up on doing one for us. Then I can have the work of Bee and Duey in our house! Loooove it! I love your artwork. Great job! 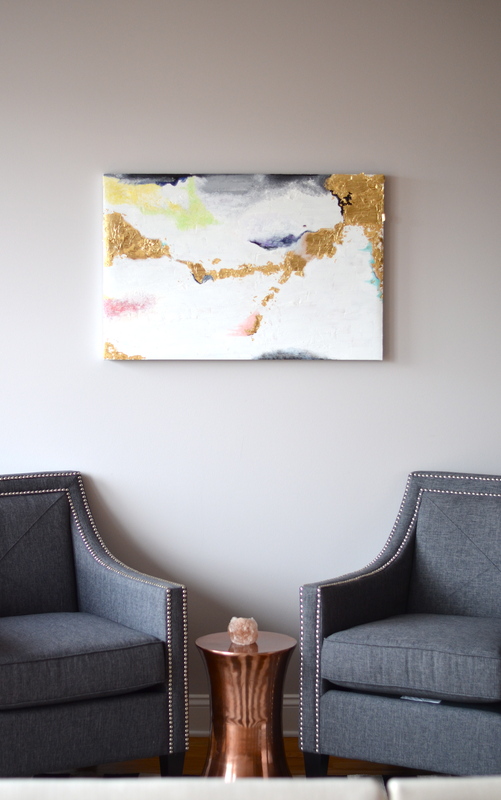 The best part of DIY art is you can match it to your furniture and decor and it’s so unique. You would have to pay a lot of money for that in the art galleries, seriously.